What's In the Fool's Satchel? Was I ever in for a surprise. For some reason I thought he’d be carrying around fun stuff. But no. At least not on this trip. Using the RWS, I pulled four cards. 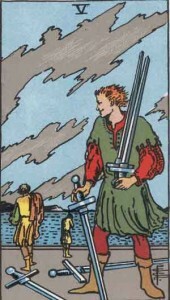 The first I got was the 5 of Swords. This is about conflict. Winning the battle, but losing the war. 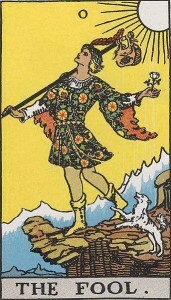 Defeat is the key word on the Thoth Tarot’s version. A defeat that comes from forcing your way, leaving no options but yes or no. 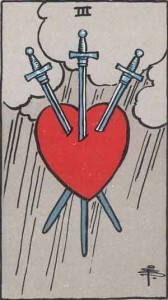 Next was the 3 of Swords. Sorrow. This is one of the most painful cards in the deck. It’s deep sadness, carried in the heart and too often in silence. After that came #13, Death. What’s there to say here except that the Fool carries one scary satchel! 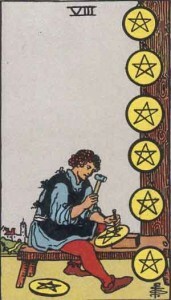 The final card I drew was the 8 of Disks. There’s nothing overtly disturbing about this card. In fact it can sometimes be quite pleasant. Given what else was in the bag, however, I can’t help but read it as tedium. It’s the work you have to do but really don’t want to. A reminder that nothing good comes without some effort. Why would the Fool carry these things around? He’s such a lighthearted guy and has such a small bag. Why fill it with the hard stuff? Maybe part of the answer lies in what’s in his other hand. It’s a white flower, symbol of purity, openness, unsullied ideals. It’s the colour of the dog beside him, free, enthusiastic and running on instinct. He holds the flower playfully with his fingers, touching it directly. These energies are how he expresses himself to the outside world. The dark stuff is hidden in a bag at the end of a pole, slung over the side we don’t see. It’s in the deep recesses of his subconscious, not even connected directly to him. What’s in the satchel balances out the flower, could be its shadow. Notice that the bag and the flower are both directly below the sun. 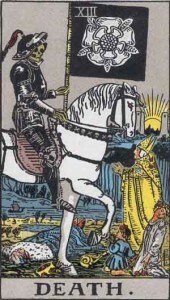 I was surprised by what the Fool carries around, but with some reflection it makes a lot of sense. The seed of all things is part of what he stands for. Though innocence, openness and the ideal are at the forefront, conflict, pain and tedium are part of life as well. On a more positive note, you could also think of the Fool’s satchel as a medicine bag. He’s carrying around a bit of the bad stuff in case he needs it as an antidote. Either way, now that I’ve taken a peek inside, I’m thinking it’s probably best to just keep this satchel closed. § 8 Responses to What's In the Fool's Satchel?" I have some interesting graffitti type shots from New Orleans (the Marigny district). I posted them on my blog a couple weeks ago. They are amazing ( the art not my photos) and I would be happy to email you a copy of any if you can use them. You might have to clean them up a bit in photoshop. Unless of course you are trying to do a whole look from your area. Anyhow they are yours if you want them. hmmmm interesting, thank you. I might just take you up on that. I’ve been planning to finish this one with just Toronto images, but I’ve been thinking of putting one together with pictures from various cities. maybe in the spring. Georgie you are wonderful. Glad you know I was just kidding with you. Love your site come here often. Blessings!! Oh and thanks a lot because of you I have to buy that new artist deck from Calif. coming out soon!! P.S. I love love your graffiti card postings. I hope you continue with that one. I was just thinking about getting the minors for the Graffiti cards together soon. I hope I have enough images or I’ll have to go out into the snowy winter streets to find more. Since it is a guy, I think there is a remote control and a big fat sub sandwich in his bag. Priorities you know!! Oh and the thorns on his rose would make a great back scratcher. and you don’t need any cards to figure that out!! lol! You are currently reading What's In the Fool's Satchel? at The Tarot Room.